How can you make money, reduce expenses or get funding with your green story? · Do you provide green products or green services? · Are you doing something green at your company that you can brag about? · Does your green product or service need funding? · If you are a company that provides green products or services, see Green Approach for Green Companies. · If you are a company that provides traditional services or products, but don’t know how that applies to green, see Green Approach for non-Green Companies. · If you are a start-up with great green ideas and need funding, see Green Approach for Cleantech Startups. Stories captivate and fascinate everyone. It's easy to remember a good story. The format is simple. A problem needs to be solved. A hero comes along to solve it, but it may require some adventure or cleverness to get there. In the end, the hero, your Cleantech company, saves the day. With a storytelling technique, your company will be the hero for your investors and customers, new and old. Cleantech Storytelling takes your concept and tells a compelling story with your company as the obvious hero. Your story will be an engaging, subtle soft sell in the form of a powerful business document. How a Green Story Gets Created details the process used to minimize your time in getting an engaging, easy-to-read, well organized green story. Cleantech Storytelling Services outlines different mechanisms to tell your story and pricing. Why Krishna Avva? gives you the intangibles and a little background on why I am the best person to tell your Cleantech story to get that much needed funding. Take a look at some Samples in Storyteller format. Testimonials tell you why my customers love my work. Useful Links directs you to other sites with additional information and resources on Cleantech and Renewable Energy. 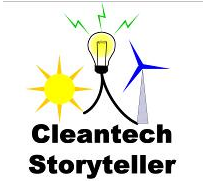 Contact the Cleantech Storyteller and start your story today.